Non-hodgkin's lymphoma grade four and an incurable brain virus invaded the life a good man, Dale Morrison. In a six year moment in time, he battled, winning, losing, repeating. Between his battles Dale's two year old granddaughter developed a brain cancer. Only three years earlier, Dale lost his mother to cancer. Being a good man couldn't fix things. 40 major tumors in Dale's body and the cancer was also in his bone marrow (left). The tumors are so bad they completely obscure his spine. Three months later, no tumors (right). Progressive multifocal leukoencephalopathy (PML) is a rare and usually fatal viral disease characterized by progressive damage of the brain at multiple locations. Chemotherapy, CHOP programs, spinal taps, and a chest port inserted under his left collarbone were painful. The screws of a biopsy halo worse. Bone marrow transplant beyond comparison. Being a good man didn't fix things, but affliction would not have the final word. Through the prayers of thousands, countless treatments and the healing hand of God, hope renewed; hope conquered doubt. Attitude is important. With a foundation of faith, Dale learned to trust his doctors. He learned to walk into the chemo room with a smile on his face. Attitude influences mindset and mindset contributes to outcome. Once a big strong man, Dale discovered his strength alone was not enough. His reliance on God's Spirit renewed his mind and attitude daily. Dale found hope continually renewed by giving himself away. 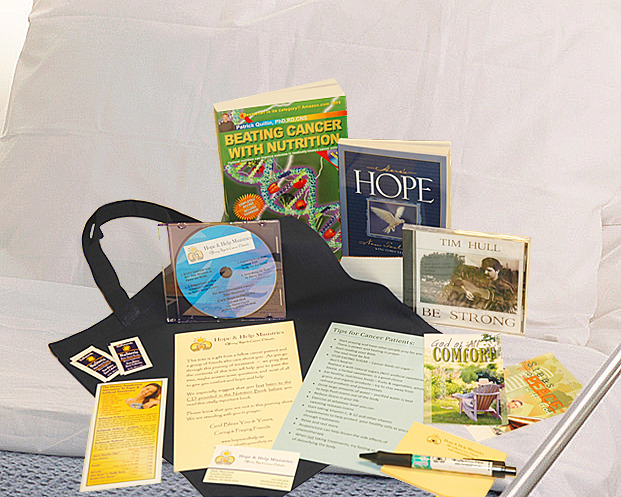 The Hope and Help Ministry was born with the idea to give away a Cancer Patient Resource Kit. In addition to the kit, the ministry now has multifaceted outreach including Dale's book, speaking engagements, and more. No more injections, no more treatments, no more pain. Delivered from affliction, Dale's purpose now is to bring hope and help to those afflicted with a cancer diagnosis. The battle can be won, the finish can be strong. Engaging people through his newsletter, recovery kit distribution, speaking and book, he brings hope and help to people of all ages everywhere. Connecting people one on one or thousands at a time, Dale impacts his audience with the miracles that happened in his life. His message inspires and motivation empowers. Learn more about Dale's speaking engagements. This book started as a farewell, a goodbye to family and friends. Reading Hope and Help from a Cancer Survivor: A Memoir of Faith Amidst Affliction will open your eyes to the reasons you have for hope. Read more or order now.